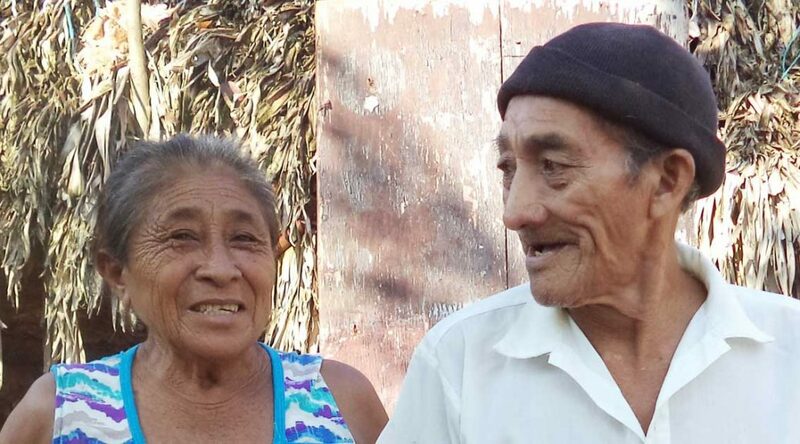 Eustaquia stands arm in arm with her husband, Felipe, outside their home. After his accident, she became the family’s main provider. Eustaquia puts items that can be recycled into her cart. People committed to recycling recognize beauty and worth in what others discard. Some also recognize a way to generate income. Eustaquia is an elder who recycles to earn a living. Now 76, she lives in Mexico with her husband, Felipe, whom she describes as her “wonderful companion.” Together, they raised seven children, now all grown and married. Felipe was seriously injured in an accidental shooting 14 years ago, after which he suffered debilitating memory loss and was unable to work. As a result, Eustaquia needed to find a way to earn an income and began recycling. By now Eustaquia has a routine. She knows where to go and she has developed a keen eye for what “trash” to look for. The income Eustaquia earns from recycling is modest, but it’s supplemented by the support she receives as an Unbound sponsored elder. Her sponsors are Jonas and Kathy from Illinois. “I’ve been sponsored for about eight years,” she said. “Unbound has helped us so much, especially with food supplies. I get nice, delicious food from Unbound. It makes our life a lot better. Read more stories about the steadfastness of elders.